What Did Jesus Mean When He Said “I Am The Lord Of The Sabbath”? What did Jesus mean by saying He is Lord of the Sabbath? What does that mean for Christians? Jesus did a lot of things to anger the religious leaders of His day; no surprise there, but Jesus got angry too…it was called righteous indignation and He was angry with the religious leaders who had made the Sabbath such a heavy burden that I would imagine most people dreaded it’s coming. How tragic because Jesus said that “the Sabbath was made for man and not man for the Sabbath. So the Son of Man is lord even of the Sabbath” (Mark 2:27-28). What Jesus was saying was that the Sabbath was made for man and that it was meant for our good. God knows we’re dust and understands how fragile our frame is (Psalm 103:14) and knowing us, since He created us, He knows that we need to have one day of rest in seven. God never intended the Sabbath to become a burden but that’s what the religious leaders of Jesus’ day had done. They made that day seem to everyone to be like a camel that’s been weighed down by every possible weight imaginable. In fact, they had added hundreds of other manmade traditions, which they considered to be equal to or in some cases, greater than the law, that were not in the original Sabbath command. This was exactly the opposite of what God had intended for the Sabbath to be. Isn’t someone who created something the owner of it? Can’t they do whatsoever they please with it? In this way, Jesus, being the Creator (John 1:3; Col 1:16), has every right to do whatever He pleases on the Sabbath, just as anyone of the disciples had when they were with Him. That’s why Jesus said that He was Lord of the Sabbath. The word Lord denotes sovereign rights and ownership so who can tell Jesus what He can and what He cannot do on the Sabbath? That’s like having someone come into your house that you had built and telling you that you’re air conditioning system is wrong and you have the electrical system not up to their standards, therefore it’s in violation of what they think it should be. The religious leaders would come into your home and condemn you for not having the house meet their own manmade set of rules and regulations. They wouldn’t care that it’s up to the standard of the local zoning laws and is exactly what they recommended to be legal in your city or county; they would only care what they thought it should be, regardless of what the law actually said. That’s why Jesus often rebuked the religious leaders of the day because they were making the Sabbath something that no one could possibly keep, at least according to their own self-righteous standards. We had to move a widower out of her home years ago on a Sunday because that was the only day most of the men could do it so we moved her into a smaller, government subsidized housing unit and the neighbors there who attended a Sabbath-keeping church thought we were breaking the law. I recalled what Jesus said when He saw a man with a withered hand that He was going to heal and they asked Him “Is it lawful to heal on the Sabbath?”—so that they might accuse him” (Matt 12:10). Notice it wasn’t because they cared for the man but they only wanted to accuse Him. I could have repeated to these “Sabbath-keepers” that were judging us for helping out a widow on a Sunday what Jesus asked “Is it lawful on the Sabbath to do good or to do harm, to save life or to kill?” But they were silent” (Mark 3:4). Then Jesus answered “Which one of you who has a sheep, if it falls into a pit on the Sabbath, will not take hold of it and lift it out? Of how much more value is a man than a sheep! So it is lawful to do good on the Sabbath.” Then he said to the man, “Stretch out your hand.” And the man stretched it out, and it was restored, healthy like the other” (Matt 12:11-13). You would think they’d celebrate that someone was healed “But the Pharisees went out and conspired against him, how to destroy him” (Matt 12:14). How hard hearted can you be?! They wanted to destroy Him because He healed on the Sabbath even though the Sabbath law gave allowance for merciful acts for animals…but not humans!? No wonder “He looked around at them in anger and, deeply distressed at their stubborn hearts, said to the man, “Stretch out your hand.” He stretched it out, and his hand was completely restored” (Mark 3:5). On one occurrence, “Jesus went through the grainfields on the Sabbath. His disciples were hungry and began to pick some heads of grain and eat them” (Matt 12:1) but what was the reaction of the Pharisees? “Look, your disciples are doing what is not lawful to do on the Sabbath” (Matt 12:2). God always puts mercy above sacrifice, and in this case the supposed sacrifice that the Pharisees took on their keeping the Sabbath, which is why Jesus said “I desire mercy, and not sacrifice,’ you would not have condemned the guiltless. For the Son of Man is lord of the Sabbath” (Matt 12:7-8). The law allowed for acts of mercy on the Sabbath for animals and certainly for people and they must have known that so Jesus chastised them by telling them they’re “making void the word of God by your tradition that you have handed down. And many such things you do” (Mark 7:13). Elsewhere He said “If one of you has a child or an ox that falls into a well on the Sabbath day, will you not immediately pull it out” (Luke 14:5)? No wonder that Jesus was often angry at their coldness of heart. They cared nothing for acts of mercy…they only wanted others to keep their own self-righteous traditions, which as I wrote earlier, making them equal to or greater than the actual Sabbath Law given. 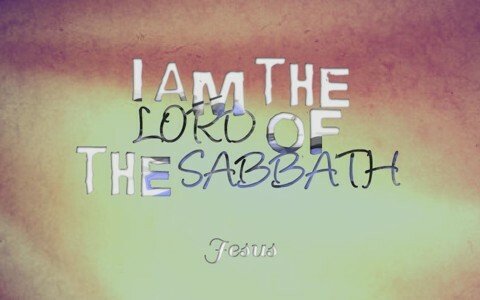 Jesus is the Lord of the Sabbath. We cannot judge others for what they do on Sunday and for others, what they do on Saturday. I’ve had so many people tell me that I have the mark of the beast because I worship on Sunday instead of Saturday, even though there is no command for Sabbath-keeping anywhere in the New Testament. When God spoke about the Sabbath law He always qualified it with “To you Oh Israel,” besides, Jesus is Lord of the Sabbath and Lord of every day for that matter and the point is, the Sabbath was made for us…we were not made for the Sabbath. Thank you Tynesha…I get a lot of such comments by those who don’t understand what this mark is and it saddens me to have other professing Christians judge others so harshly when we are told not too. This was educational to me and a matter of concern. I do wonder about the Commandment of keeping the sabbath holy. I thought that was meant for resting. I am a bit confused now. A tough sell Pastor Jack and a brave topic. There are those who will tell us that the fourth Commandment is still a Commandment and is no less to be obeyed and honored than the other nine. That Saturday is THE day and no other. Others say, as you mentioned, that Jesus ‘IS” our Sabbath Rest, Lord of the Sabbath, and we “Rest” in Him. Paul’s point here was to not be bound by schedules or foods. It was not telling us to throw out the Fourth Commandment. I believe we are to set aside one day a week to honor God by ceasing from our work, which in turn is to restore our bodies and souls, for God wants us to be refreshed. We shouldn’t get crazy about it and tell our wives we can’t take the garbage out or wash the dishes. That legalism is what Jesus threw in the face of the Pharisees by healing on their Sabbath. He was showing, once again, that man was not made to obey a bunch of rules on the Sabbath. The Sabbath was created for us (Mk 2:27). Well said brother. I got a lot of heat from this and some comments (that were not approved) were bordering on the outrageous like Sunday worship is the mark of the beast and we profaning the Sabbath (Saturday) by working on it but I believe that we should make every day the Lord’s day but rest is certainly needed for me in one day in seven…for me that is more often Saturday or Monday but even then, I don’t take it too far (e.g. the trash, dishes, etc.). the real question should be, has anyone set aside a whole day regardless the day of week and dedicate that day to the lord the whole 24 hours for prayer, studding scripture, fellowshiping and giving god praise and thank for his sacrifice. Im afraid very few do that in this country thats real sabbath keeping loving God and our neighbors. Greg, if you can show me that a person is saved by keeping the Ten Commandments in the Bible, then we can talk. Please read Galatians chapter 3 to see what I mean. Jesus fulfilled the law, yes, but not how you think by keeping the Sabbath. Hello friend. A righteous man is an example of the Sabbath? Can you explain that or give us a Scripture reference? We ought to live holy lives every day so you are right in that sense. Thank you. Next post: What Is The Definition Of Firmament In The Bible?